Anyone driving through downtown Wheaton bright and early on October 21 could see something was happening at the Country Corner Cafe. 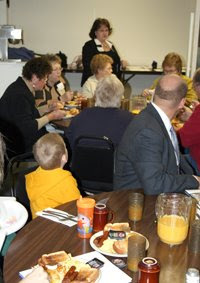 About 35 residents, business people, nonprofit representatives, public officials and community leaders filled the cafe's community room to enjoy a hearty breakfast and to talk about their town at the WCI-hosted community meeting. What did folks like best about Wheaton? The good people, a family friendly atmosphere, an excellent school system and a good hospital. What were some of the concerns? Duebers variety store closing, young people leaving town due to the lack of good-paying jobs, few opportunities for young people to socialize in a healthy way, no local food source. What were some ideas generated by the group? Come together regularly to talk about issues and create a plan for action. Find more ways--like the pool renovation and the early childhood mental health coalition--to bring families together for fun and education in Wheaton. Consider starting a local food co-op. Start up businesses that cater to young people. Consider a community-owned wind energy co-op. The breakfasts have been a good way of generating discussion in our region. WCI staff plan to head to Alexandria, Moorhead and Frazee in the next few weeks to stir up a little more conversation! It's fun to be cavity free!